I first posted about these a couple of weeks ago. 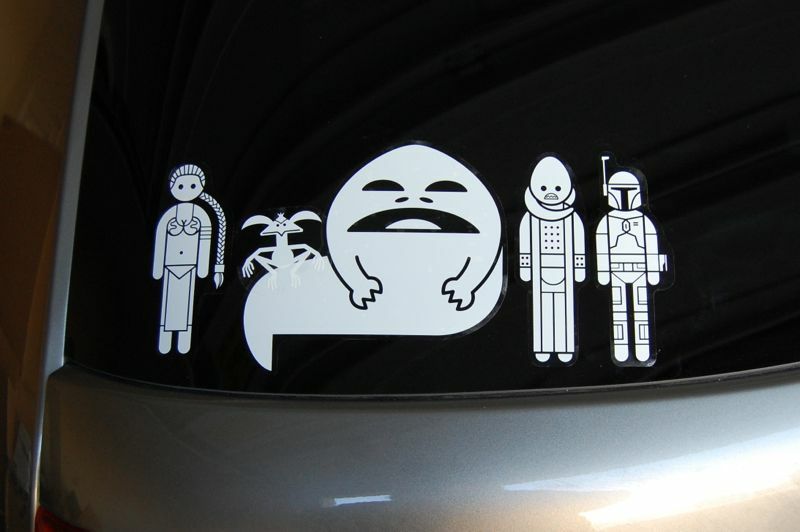 I’m not really a big fan of the little stickers that many people put in their cars’ rear windows to indicate each member of their family (often including pets). 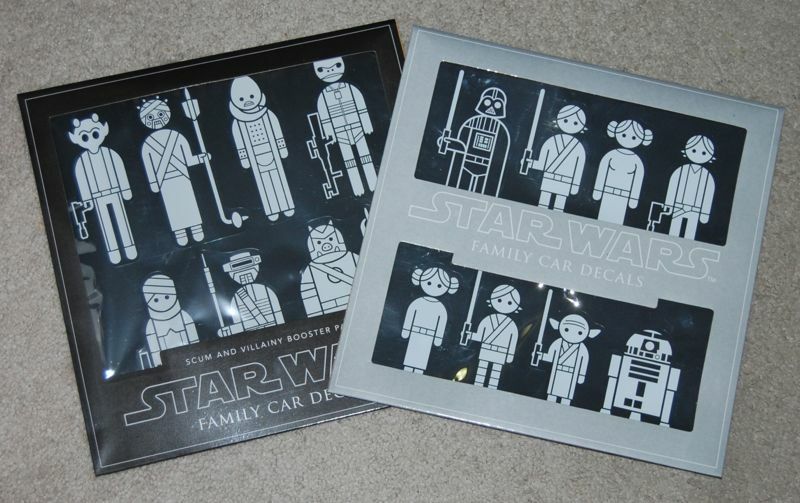 But I’ll have to admit that the Star Wars versions from Think Geek are pretty cute. The first pack includes quite a few Star Wars characters, including some “kid” versions so you could have (for example) Darth Vader be the father, Padme be the mother and Luke and Leia be the kids. Or you could even have your kids be stormtroopers. When they released a “Scum and Villainy Booster Pack” with most of my favorite characters (including a very respectable selection of Jabba’s Palace characters), I couldn’t resist picking up both sets. The booster pack includes a lot of monsters like the bantha, wampa, tauntaun, and rancor, plus a lot of cool aliens. 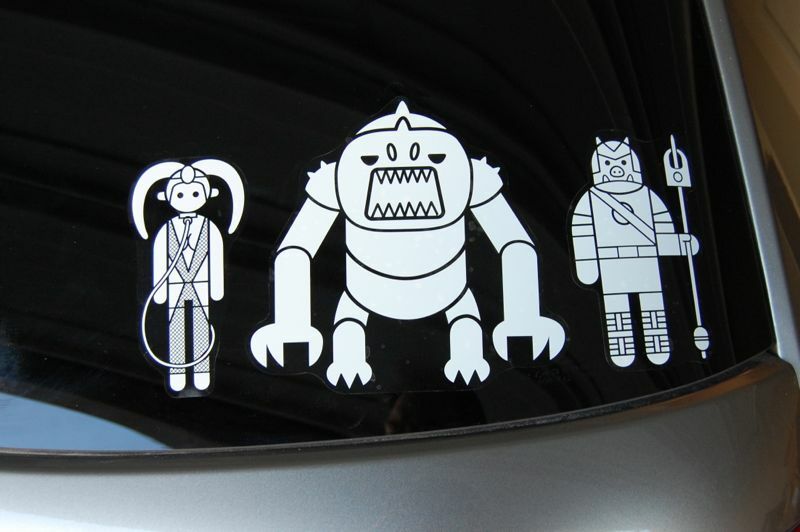 Obviously, these are less suited to the “represent your family with stickers” concept, but that’s fine with me. They’re great for making a little scene on your car window or even on a window in a kid’s room. One thing I should mention is that Think Geek originally said there would be two of each decal in the Scum and Villainy pack, just as there was in the original pack. However, I discovered after ordering that this is not the case. I wrote to their customer service department and explained how the email I received about the set and the website itself originally indicated that you would get two of each decal, so they sent me an extra set. (I’ve always had good experiences with their customer service.) But if you’re thinking of making an order, do be aware that you only get one of each. This is a little disappointing since the price is the same for both packs, but of course many of the decals in the booster pack are much bigger than the ones in the original pack. Here they are on my car. It has a rear windshield wiper so I thought it would be best to put the decals on either side of it. I put the Salacious Crumb decal partially on top of the Jabba one, since that seemed to work best in terms of composition. When I ordered these I wasn’t even sure that I was going to actually use them, but I think they look really cute and they’re a unique way to broadcast my Star Wars (and Jabba) fanboy status to others who are in the know.